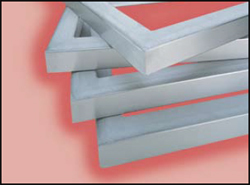 Diamond Chase Stretch and Glue screen printing frames are manufactured from high-quality, custom made extrusions. Specifically designed by Diamond Chase, these profiles have rounded edges for comfortable handling and are engineered for the strength and weight characteristics required. Each frame is welded watertight, leveled, and sandblasted for excellent adhesion. The Double Hollow design involves two stacked hollow sections in the frame. This allows for greater tensioning capacity with only a minimal (25-30%) increase in the weight of the frame. The addition of a third horizontal member within the interior of the frame greatly reduces the deflection under high tensions. Deflection in most circumstances, has been reduced more than 50%. Stronger is BETTER. Stronger construction allows the frame profile to be narrower compared to the average stretch and glue frame commonly used. The narrower frame profile allows for greater image area and optimum printing capacity.